With the popularity of auto-themed rec rooms and garages, demand for the appropriate furniture and accessories has never been greater. 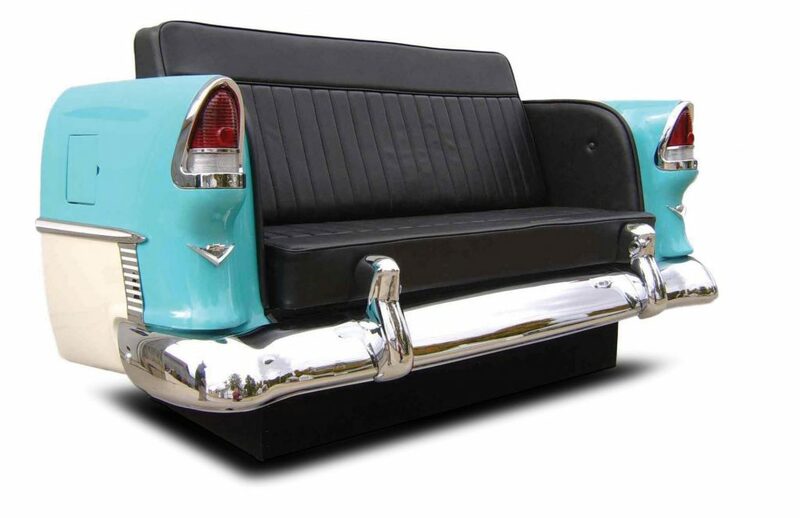 Car Furniture Inc. sells an assortment of couches and love seats that are made from rear ends of actual classic and sports cars and are not fiberglass copies. For example, the trunk portion of this 1955 Chevrolet stands 36 inches tall by 74 inches wide and fits through a standard 32-inch doorway. Available body colors include red, black, pink and turquoise, while the upholstery comes in red, black, tan, or white. Note that the sofa weights about 500 pounds so it might be difficult to move into your basement. Order one for $8,500 at www.carfurniture.com.